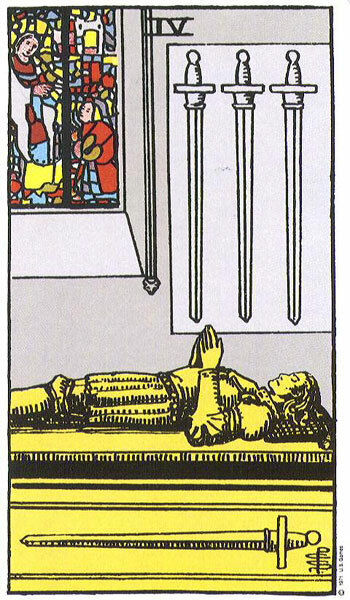 As we enter the Four of Swords we immediately feel a sombre stillness as we silently gaze upon the figure of a Knight laid out on a tomb. The tomb lies within a spiritual building and if we close our eyes and let our imagination wander we can almost smell the unmistakable scent of incense and candle wax. We can also sense the air of silence that engulfs this Knight. The Knight is clad in a suit of armour and so we must assume that he has been engaged in a battle of some sort and has needed to protect himself. He is missing his helmet which means that this Knight is either dead and no longer has need of its protection or has found a place of sanctuary where he feels safe from threat of attack. Over the Knight’s head hang three very familiar Swords. These are the Swords we encountered in the Three of Swords as they viciously pierced through the heart bringing pain, hurt, trauma and stress. We now know who the heart belonged to and the injury caused. The three Swords still hang over him in a very threatening manner letting us know that his problems have not necessarily gone away. However, this Knight has been on the front line too long and through injury or just pure exhaustion no longer has the energy or stomach for the fight. The Knight has retreated from the battle scene and sought sanctuary in a spiritual place such as a church or monastery. Tired, wounded and exhausted he is carried to a quiet and secluded area and laid down to rest on a tomb-like bed. A cushion is placed under his head to provide comfort and a respite from all the blows it has received. His body may be weary from constant battle but it is his head that is the most fatigued. He is mentally worn out with the stress in his life. He needs deep restful sleep and proper nourishment. The upset and pain experienced in the Three has taken its toll on this poor Knight forcing him to step back and distance himself for the moment from his problems or issues. He has retreated from life to a safe place for the time being. It is here and during this time that he will attempt to heal his wounds. When we speak of the wounds inflicted by the Three Swords they may be physical, emotional or psychological. In fact when we are dealing with the Swords Suit, they could be all three and even a fourth if we include spiritual wounding. Although the Knight looks dead, it is unlikely the case. He is simply overwhelmed by his situation which has knocked the legs out from underneath him. He has either taken to the bed himself or has been ordered there by a doctor or priest. This Knight needs to understand that he is not immortal. There is no way anyone could have expected him to keep going under the circumstances. He was running on empty for some time and this crash was bound to happen. On the other hand, the Knight himself may have realised that he could do no more under the circumstances and that stepping back or retreating from the situation would give him the time to get his head together and re-group. If he had any sense he has chosen to lie down and re-charge his batteries. He has either voluntarily retired from the battle scene or it has been forced upon him. As a Knight this may be a very difficult thing for him to do as Knights are not used to resting and taking their time. However, this Knight needs to do just that and understand that this time of inactivity and passivity will not be forever. He also must realise that just because he lies there as still as stone, it does not mean that internally he is not active. On the contrary, the Knight will discover that when he does lie down or step back from all the external din and clamour of the battle, the ensuing silence and tranquility will help him gain perspective and balance. It will give him time to really get to grips with the key issues at stake. The Three Swords hang over the Knight leading him to believe that he has multiple problems to bear or deal with, but in reality it is the fourth Sword lying horizontally beneath him that is the most pressing. By prioritising and dealing with the main issue and not the pettiness around it he may be able to rid himself of all his troubles. He must ask himself what the real problem is and once identified must concentrate his focus on making it his number one priority. As a Sword personality, once he is given space, he will use his logic and reason to find solutions. In his meditative state understanding will filter through from his subconscious to his conscious. As we silently watch over this worn out Knight, we notice that he has his hands joined in prayer. We also notice the stained glass window above him. The colourful stained glass depicts the image of a saint with a halo giving spiritual support and counsel to a disciple who kneels before him. Regardless of what the Knight has been through he has not lost his faith. He prays to his Gods for help and support during this difficult time and in the stained glass we see that his prayers have been heard and are being answered. The Knight may lie on a grey cold tomb but his body is bathed in the glow of yellowy-golden light that streams down from the stained glass bringing the comforting message from above that all will be well. Even though he looks a solitary figure on his tomb, he is not alone. Others are there to help or watch over him. The Knight may be receiving help from a doctor, counsellor or spiritual person. He may also have the support of friends and family even though they could find it hard to reach him during his time. He may be withdrawn, uncommunicative and not his usual self. The tomb that this Knight lies on can often represent or symbolise a hospital bed and the hushed nature of the room he lies in that of an Intensive Care Unit. When stress reaches significant levels without any effort to control or restrain it, then typically the physical body can break down. Illnesses of all kinds can find their root cause in stress. We understand the psychological illness that can manifest as a result of stress but we must also acknowledge that the likes of grief, bereavement and trauma can also leave physical scars. This Knight may have succumbed to his situation. If he has not taken the steps to heal and deal with his problems or loss then it may make him very ill indeed. Ill enough that hospitalisation may be needed. On the positive side, hospital stays represented by The Four of Swords are generally temporary and a full recovery can be expected. However, it does act as a warning that health may suffer if stress is not relieved. Before we leave this Knight in peace and quiet to complete his recovery period, it is important to remember that he cannot stay on that tomb forever. His resting place is only temporary and effort must be made on his behalf to get better. He must be willing to release those three Swords that hang over him and move on and become reconciled to his situation. He will be expected to have gained some deep understanding of his predicament and his own share of the responsibility. If he has loved and lost or been bereaved he must learn to accept grief and loss as a natural part of life. He must become aware that he is still very much alive and therefore must prepare to start anew with hope and faith. He must wake up, sit up and take the necessary steps to leave this place of sanctuary and stasis behind to join the living once more . Because he is a Knight and made of strong stuff we believe he will do just that. He will come out of his coma-like state and live to fight another day. The Four of Swords generally suggests that you are mentally overwhelmed and stressed by a particular situation or multiple situations in your life. Intense pressure surrounds you now and you may be finding it hard to think clearly as your mind is overloaded. The upset in the Three is taking its toll suggesting that the situation in question wounded both mentally and emotionally. Unfortunately, now we see that physically you are no longer able to cope. The best thing you can do now is step back and distance yourself from the situation until you are strong enough to face it again. Facing you situation may include choosing to back down from a terrible conflict or row. You may also have to face the fact that a relationship or marriage is over and that your partner no longer loves you. It may be that you have to come to terms with the death of a loved one who is never going to come back. The Four of Swords typically represents a low time for you. It is a time when friends and family cannot reach you. It can represent a time when you feel that you would be better off dead. You may in fact feel you have died inside. The figure being administered to in the stained glass window may be his spirit begging his creator for release. If there has been a terrible loss in your life, it is time to come to terms with it in order to heal and find stability again. In your present state you cannot deal with your situation. You need to step back and distance yourself from it. By doing so you can regroup and recharge your worn out batteries. You are running on empty at the moment. It is important to take time out now. It will put you in a much better position to deal with your problems. You need to find peace and quiet and the sooner the better. The Knight lying on the tomb implores you to do so. When the Four of Swords appears rest is not simply sitting down for a cup of tea. The rest implied may be for a certain period of time and not one that you can rush. You need sleep badly and the deeper the better. You also need to nourish yourself. It is a time to turn your back on your world for a while and retreat into your home, bolt hole or even take a relaxing vacation. The Four of Swords carries a very real warning of the consequences of not taking care of your mental health during stressful times. If you are coping at present then this card suggests that you are close to the edge and if you do not take the necessary steps to take a break then it may very well be forced upon you. It warns of the potential for mental breakdowns, medical care and even hospitalisation. The person represented by the this card may not be you so it is important to be observant of friends and family when the Four of Swords appears as outside appearances can be deceiving. Someone you know who has been through a tough time may look as if the are coping but the reality may be very different. Confused and feeling powerless they may keep their worries to themself. When this card appears it may advise that receiving counselling for your issues would be of benefit. Sometimes, when we are in the middle of turmoil and upset, we cannot see the wood for the trees and turning to a calm and non-judgemental third-party can bring clarity and a new perspective. The third-party could be a friend, family member, doctor, counsellor, spiritual or religious guide. It is important not to lose your faith at this time for it is possible to make a full recovery even though you may feel very low right now. Where your problems are concerned, you need to take a long hard look at them and see what is worth all your worry and what is not. You may think that you have multiple problems but in your state you are probably blowing them all out of proportion. This is why you need to step back for a while and sort your head out. You will more than likely find that there is only one main issue that needs your focussed concentration and the rest is mere dressing around it. prioritise. Deal with the important issue and you will find that the surrounding ones will dissolve and vanish as a result. You are spreading yourself too thin and frazzling your nerves by trying to cover every area. The Four of Swords also raises the possibility that you may have got yourself into an unpleasant situation and now find that you cannot face people. You may lock yourself up in your home, refuse to answer the door or take calls. You can only keep this up for a period of time and sooner or later you are going to have to deal with the public at large and their opinions of you. You may feel ashamed or guilty of something you have done and have gone to ground and are waiting for the whole thing to blow over. The Four of Swords is associated with Illness and hospitalisation in general. Surgery or a time spent in the Intensive Care Unit or Isolation may be involved. However, rarely on its own does the Four of Swords represent an actual physical death (several more cards are needed). Therefore it normally indicates a complete recovery after an illness but there will definitely be a period of convalescence as one is confined to bed. Comas may also be suggested but the activity in the stained glass window indicates that the mind or brain is still aware. The Four of Swords can sometimes represent incarceration or imprisonment. In a relationship reading The Four of Swords can suggest that you are taking the time out to strengthen and consolidate your relationship. However and very unfortunately it can reveal that a partner has retreated from the relationship. They may be silent, distant and avoid communication or physical contact. You may feel that your relationship or marriage has died. It is important to sit this one out though and not give in to knee-jerk reactions. Remember that the Knight lying on the tomb although appearing very much dead, is probably not. He just needs time to recover and gather his thoughts. The same too could be happening with your relationship and it is very possible that it will survive this time once you allow each other a bit of space. There may be things going on that are not very clear to you at the moment. Perhaps some Marriage Counselling would be beneficial. The Four of Swords can also highlight that time when you need to heal from a broken relationship. We can all identify with this scenario as we take to the bed and cry ourself to sleep each night. With no interest in even washing or eating, we keep to ourselves and shun all social invitations. This time of despair is necessary and essential as it gives us time to come to terms with the end of a relationship and helps us discover our strengths and weaknesses. If this is you at present then enjoy your scruffy, puffy eyed period as time heals and you will soon bounce back. Before leaving relationships behind we must also address one of the more negative aspects of this card. Depending on the support of surrounding cards The Four of Swords in a relationship reading can represent finding refuge or sanctuary from an abusive partner. In more extreme cases, but this becomes more evident in the reversed Four, there could be injury and possible hospitalisation as a result of abuse. An abundance of Swords Cards, especially the Five, Eight, Nine and Ten of Swords along with Reversed Court Cards and the Devil of The Major Arcana would really give you cause for worry. In a career reading very little work is being done except on the inside. It can suggest that the pressure or stresses of your job are getting you down or laying you low. The recession may have caused staff cutbacks and you now find yourself doing three people’s work and it is just too much. If you are in business, then the worry and strain of making bank repayments and finding the salaries for your workforce each week could be slowly but surely breaking you down. You may be at the end of your tether and are finding it hard to cope. You need time off and now. If you have any vacation left to take then now would be a good time. If you can get someone trustworthy to man the business for a week or two then do so. Otherwise you may become ill and will then be forced to take time off due to mental exhaustion. You are at the edge of the cliff right now. You need to step back for a while to rest and let your thoughts settle. Your mind is on overdrive at present. Once at a distance you need to reconsider your working life. During this time of retreat you may discover that your priorities shift or that you find workable solutions to your problems. The Four of Swords can represent counselling as a profession or teaching meditation. Your job however, may involve you working with the dead or dying. Working in the funeral business. Alternatively, you may feel that your job is boring you to death or that the love you once had for your job has now died. With The Four of Swords Reversed you can look forward to making a recovery after a worrying illness but it will be slow. Take your time and don’t try to rush things or you might undo all the good work. You can soon look forward to being discharged from hospital or being moved out of Intensive Care as your condition improves. It can also represent awakening from a coma or someone who has a near death experience. When the Four of Swords reverses it is a sign that a period of isolation is coming to an end and it is now time to re-enter life. Not only have you have regained your mental and physical strength but you now have a clear understanding of how things came to be. This has given you a new outlook on life and a firm resolve on how you now wish to live yours. You will be the first person to agree that the break, even though it may have been hard at times, was exactly what you needed. You realise now that you could never have kept going the way you were. You will be determined never to let yourself get that low or stressed again about anything. Instead of wishing that you were dead, you now are so glad to be alive as you begin to see the colour in the world again and make plans for your life. You have certainly learned a lot about yourself and understand that even though you thought you were strong and invincible, it was not a sign of weaknesses to ask for help or to admit that you couldn’t cope. You must proceed cautiously as there may be areas of your being that are still fragile and vulnerable but you are certainly over the worst now. On the other hand, because this is a reversed card, if you have not taken time out to heal and have just kept going then you may be experiencing serious chronic stress. The figure in this Reversed Four looks like he may very well fall onto the Three Swords (his problems and issues). The choice is his. He can choose to open his eyes and jump out-of-the-way before their sharp blades pierce his skin or he can stay as he is. He may have lost all faith of ever sorting his problems and may think that it would be better all round if he were to fall on these Swords and get it over with. Others have probably approaced him in concern but he is unlikely to have listened to any well-meaning advice. Mentally he may be breaking down. Psychologically, he could be in a very dangerous place and considering taking drastic measures to deal with his situation once and for all. Urgent effort on his part is now essential if he is ever to regain his balance again. Professional help may need to be called in and the sooner the better. Family and friends need to rally round as this person needs serious support if they are to come out of this in one piece. You would need to be alerted to this situation by the presence of other worrying cards in the spread. Again, these cards would be the usual dark and heavy Swords Cards, especially the Eight, Nine, Ten, Devil, Moon Reversed, Tower, Reversed Sword Court Cards for example. The Four of Swords reversed can also represent the end of a period of mourning after a bereavement. You now have renewed strength, a deeper understanding of life and the acceptance of the death of a loved one. Enough time has been spent grieving and resting up. You are still very much alive and must take your place again in society. You will always carry your loved one in your heart and they will never be forgotten. unfortunately sleep problems due to insomnia and strong dreams may be suggested this reversed Four and is more pronounced if also found with the Nine of Swords. You may be experiencing some strange nighttime activity such as out-of-body experience or astral travel. You may also be aware of spiritual activity around you during the night. Even though this is more than likely benign and just a sign that you are developing psychically, it can have a very disturbing effect on the quality of your sleep leaving you tired and drawn during the day. This card can also be the “get out of jail” card and may suggest an end to confinement or imprisonment. Where relationships are concerned, The Four of Swords Reversed often brings release from a relationship that felt like a prison. If you have sought help or sanctuary from a violent partner, you are beginning to feel stronger in yourself and ready to finally deal with your relationship. You are in a safe place where you cannot be got at so you can now make plans for a new life. You understand that you cannot stay there for ever but through the help of others be they friends, family, professionals or volunteers you are now equipped to stand on your own two feet. However, you may have a pattern of running to refuges or homes during episodes of violence only to return to your offending partner and give him or her another chance to reform. Undoubtedly, you end up back at the refuge once more. There is a negative pattern and cycle operating which must be broken. You must want this yourself. Exposed and vulnerable, you fail to protect yourself. There may come a day when the violence is taken a step too far and it will be too late then. On the other hand, you may be keeping your domestic violence problems to yourself and refuse to seek help or take refuge. You could be putting up a front to family and friends but are leaving yourself in a very dangerous position as the Reversed Four of Swords can bring serious violence and injury. If you have had your heart-broken by an ex partner, then the Reversed Four of Swords understands the suffering you endured but acknowledges that now you are feeling strong enough to put yourself back out there again in search of love. So it is a time to start accepting all social invitations. Get out and about and be seen. People have been wondering where you have hidden yourself all these months. This card reversed can highlight a relationship once thought dead, or on the brink of it, slowly recovering. However, the reversed nature of this card can suggest that the relationship is dead and that there is no point trying to bring it back to life again. You will need to see what other cards appear in the spread along with communicating with the querant. I have found in the past that the querant spots the association quite easily and will be quick to admit that that is how they feel about their relationship or that it is their greatest concern. Let’s face it, the Four of Swords appearing in a relationship spread either upright or reversed has a ‘cold water in the face’ effect on any querant. They may also be just concerned about their partner if he or she is ill or in hospital so tread carefully. Work wise, you may be going back to work after a long period of time. This is typical of the mother who after years staying at home to raise children eventually decides to re-enter the workforce. However, you may be going back to work after a long illness or after having to take time off as a result of stress. If this is the case then hopefully you have completely recovered and have coping mechanisms in place to deal with stress from here on. You could also be working in a dead-end job, feeling that you are slowly dying. You may spend too much time working on your own and need to find a more lively place to work where you can interact with colleagues and meet other people. It could be time for a change of job or career. You could however be working in the funeral business or be responsible for performing post mortem or autopsies. Then again you may work in a women’s refuge or home. **We shall have to wait and see in Card Five, whether the figure in the Four has succeeded in putting the trauma and stress of his past behind him. Is he more relaxed and carefree in himself and has he learned to take life less seriously? Has he sufficiently mentally healed? What do you think? That’s the trouble with the Swords, one minute you are feeling sorry for them and the next they are running amok with their Sword. I would say there is every chance of that. Hopefully the battle is for all the right reasons. Vivien what are your thoughts on the R 4 of swords as a person returning to work after a suspension? I did a reading whether or not an employee will return to his job after being released. The outcome card was the R 4 of Swords. I don’t have a answer to the reading yet but I feel that the employee WILL return to his position. Thoughts? I know there is another message from you from a couple of days back. I apologise for only getting to them now. It was a Public Holiday Weekend in Ireland for St. Patrick’s Day and only getting to catch up with correspondence now. I will answer this one first and then go back to your earlier one. Regarding The Four of Swords Reversed I will give you my opinion. 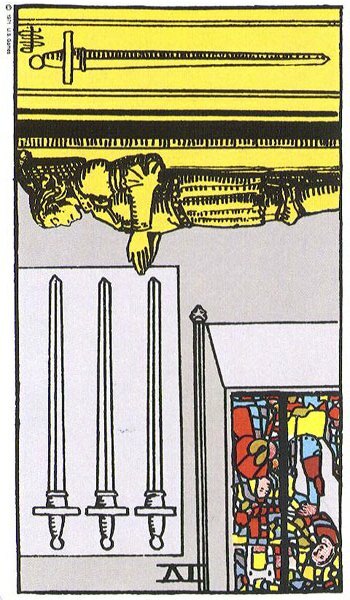 However, a lot depends on surrounding cards to flesh out in which direction the Four Reversed is leaning too. We could look at it a few ways. When The Upright Four of Swords appears to highlight an individual stepping back from work, relationship, life etc. it typically means enforced stepping back. As in, the personal circumstances have reached a point where action needs to be taken as things have gone too far, reached a danger point, or are quite serious in nature. The individual in question may not be able to keep going whether they want to or not. In this case we are dealing with an individual suspended from work. We do not know why but when the Four of Swords appears to represent it, again upright or reversed, it suggests things must have got very bad before this suspension was enforced. The Swords point to mental distress, mental dysfunction or mental exhaustion which perhaps led to extreme behaviour which could have become quite negative. This may have led the individual into doing or saying something that caused shock, disappointment and concern all round. Then again, the suspension may be a matter of company protocol, enforced for the least issue. During the period of suspension the employee may be under investigation to determine if they are culpable or not. Essentially suspension is enforced to create distance between the individual involved and the environment the incident/s occurred in while the matter is looked into. The individual is advised to give serious thought to whatever the allegations against them are. In the Upright Four of Swords the enforced withdrawal effectively creates that reflective environment. Everyone needs to get over or come to terms whatever behaviour or misdemeanor caused the suspension. And in the Four of Swords Upright we see this occur. However, this card also tells me of the psychological impact of the suspension on the individual and perhaps all those involved. In the Four of Swords he might be lying there seriously distressed and upset by what has happened. He may feel wrongfully accused, singled out, made a scapegoat out of. He may feel shame, humiliation, embarrassment if he actually is guilty. He may also feel deeply angered, vindictive and vengeful. The suspension is likely to have been a strong blow. One he may not rally around from too quickly. Think of yourself in that position. How would you feel? Where would your thoughts run to? Would you be able to view your time of suspension as a nice break from work and enjoy the freedom of it? If it was me, I would literally take to the bed. I would be gutted, seriously distressed and thinking of all mad things. Would I be counting down the days until I could get back to work. I don’t think so as it would be a cause of great anxiety for me. The Four of Swords has appeared Reversed which could suggest the period of suspension is coming to an end. He will be entitled to return to work, resume his duties etc. but it may not be that simple. Everything has changed due to the suspension. How will this person’s work colleagues welcome him/her back? Can they put it behind them, forget about it all. The Reversed Four of Swords signals the employee’s release from their period of suspension but that is all. The impact of it must surely still cut deep. The employee is entitled to return to their job, but can they, will they? Would I be able to, even if I felt I had been unjustly treated and cleared. Yes, you may be right in feeling the Reversed Four of Swords suggests the employee will return. However, due to the nature of this card, I would feel his/her return will be very fragile and pitted with anxiety. They will not return all bright and breezy looking to catch up with colleagues and work gossip. It will be a worrying time for all and not something that will settle in the immediate future. The key question is whether the returned employee will be able to settle back into work and put the whole thing behind them. That may not be so easy and could in the long-term lead them to start looking for work elsewhere. It all depends on the nature of the suspension. Was it deserved or not? Was it company protocol following an accusation or allegation? Was the employee supported by company during the period of suspension and facilitated in returning or was it all quite harshly executed? I know teachers are immediately put on a period of suspension if a student makes an allegation against them. Often the student fabricates such allegations as form of revenge over a petty slight such as not getting the exam grade they wanted, or the teacher taking them to task over bad behaviour. The school have no option but to suspend until the matter has been sorted, even though they are horrified at having to do so and know the accusation to be unjust. Their hands are tied. Even in this kind of scenario, the returning teacher returning to work after been fully exonerated and welcomed warmly may feel tainted by the accusation and could find it difficult to settle. It is a tough one. But yes, the Reversed Four of Swords could very well point to his/her return, but it won’t be easy and returning does not necessarily mean they will be able to stay. I presume there were other cards in this reading. If so, perhaps they could throw some light on how the Reversed Four of Swords will ultimately play out. I hope the above has been of some help.